Elizabeth Ording goes in for a score during the first half of Versailles’ home game with Franklin-Monroe on Tuesday night. 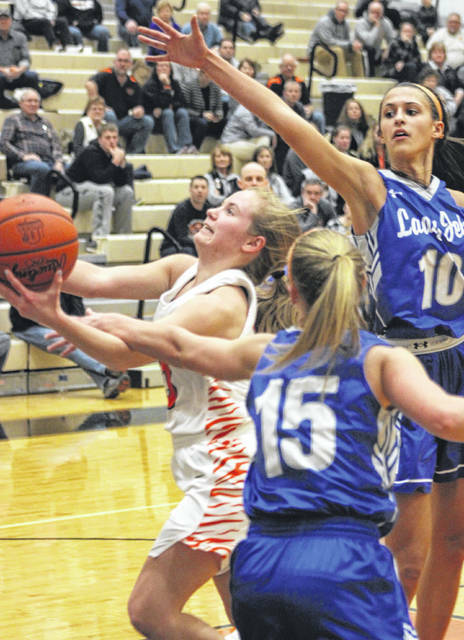 Ording had a game-high 19 points to lead the Tigers in a 58-45 win. Versailles junior Caitlin McEldowney (13) brings the ball up the floor with Franklin-Monroe’s Belle Cable (5) chasing her all the way in a non-league game on Tuesday night. McEldowney scored 17 points in helping lead the Tigers to a 58-45 win. Franklin-Monroe guard Belle Cable (5) looks for some place to go with the ball while being guarded by Versailles’ Caitlin McEldowney (13) in a non-league contest Tuesday night. The Tigers won the game, 58-45. Versailles junior Brooke Stonebraker (34) goes in for a score during a non-league contest with Franklin-Monroe on Tuesday night. The Tigers won the game, 58-45. Franklin-Monroe’s Chloe Peters (15) tries to get around Versailles’ Brooke Stonebraker (34) in a non-league contest Tuesday night. The Tigers won the game, 58-45. Franklin-Monroe’s Corina Conley (10) snatches a rebound against Versailles senior Kelsey Custenborder (33) in a non-league contest Tuesday night. The Tigers won the game, 58-45. Franklin-Monroe’s Corina Conley (10) played some defense under the basket against Versailles’ Savannah Toner (22) in a non-league contest Tuesday night. The Tigers won the game, 58-45. Versailles junior Hannah Barga (15) shoots from just inside the 3-point line in a non-league contest against Franklin-Monroe on Tuesday night. The Tigers won the game, 58-45. 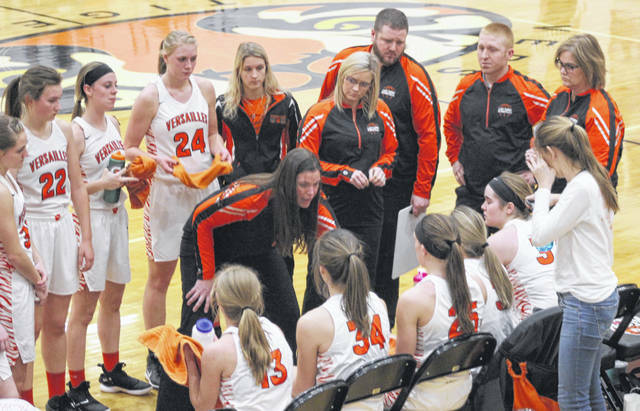 Versailles coach Jacki Stonebraker talks to her team during a time out in the second half of a non-league contest with Franklin-Monroe on Tuesday night. The Tigers won the game, 58-45. 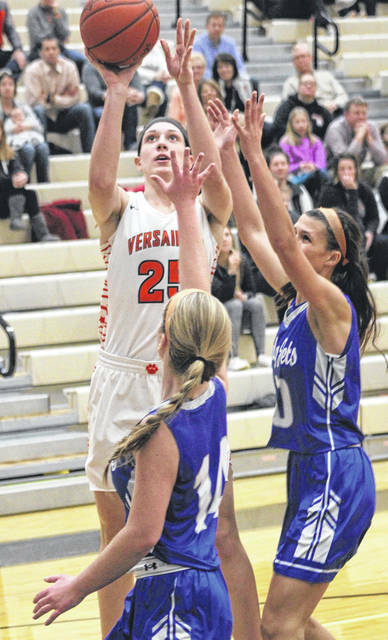 Versailles senior Kelsey Custenborder (33) goes in for a score in a non-league contest against Franklin-Monroe on Tuesday night. The Tigers won the game, 58-45. Franklin-Monroe senior Kennedy Morris (12) breaks toward the basket in a non-league contest against Versailles on Tuesday night. The Tigers won the game, 58-45. Versailles junior Lindsey Winner (25) shoots over the top of several Franklin-Monroe players in a non-league contest Tuesday night. The Tigers won the game, 58-45. 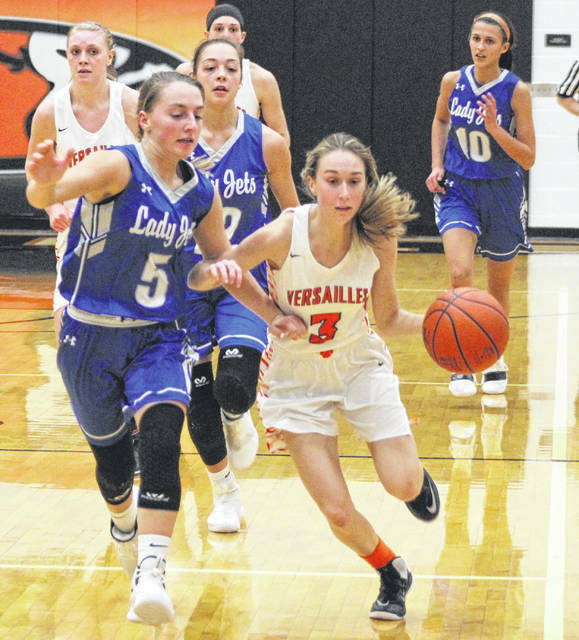 Versailles senior Liz Watren (3) brings the ball up the floor on a fastbreak with Franklin-Monroe’s Belle Cable (5) guarding her in a non-league contest Tuesday night. The Tigers won the game, 58-45. Franklin-Monroe’s Stella Shellabarger (14) picks up a loose ball and drives toward the basket in a non-league contest against Versailles on Tuesday night. The Tigers won the game, 58-45. 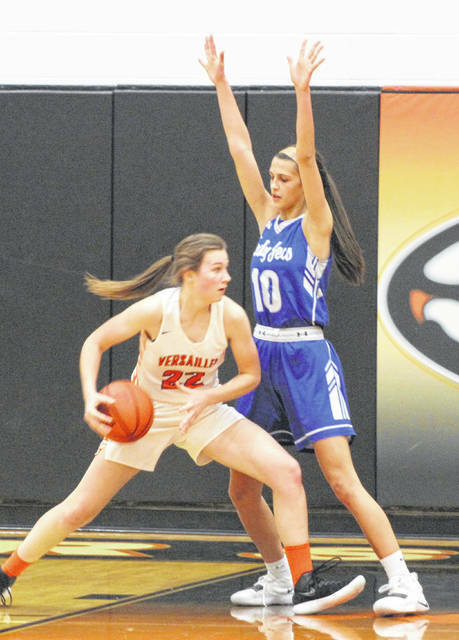 Versailles junior Caitlin McEldowney (13) splits a pair of Franklin-Monroe defenders driving to the basket in a non-league contest Tuesday night. The Tigers won the game, 58-45. 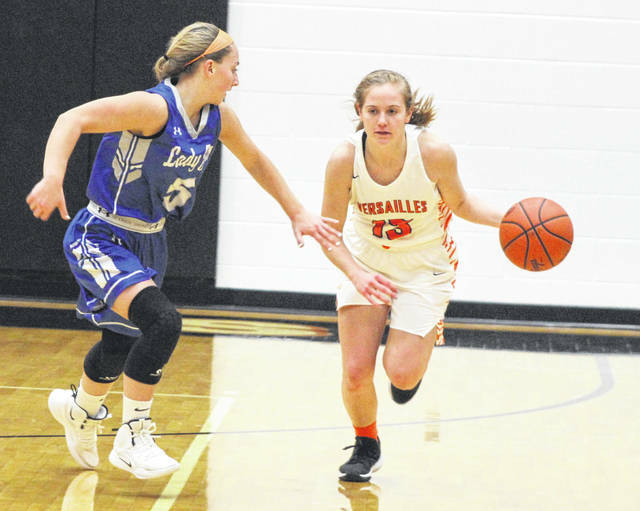 VERSAILLES – A second-half switch of offenses did the trick as Versailles rallied from being down by five at halftime to defeating Darke County rival Franklin-Monroe 58-45 on Tuesday night. 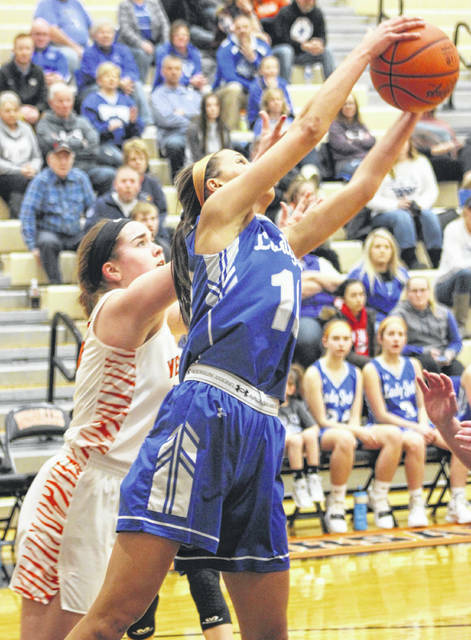 VHS coach Jacki Stonebraker said she switched to a four-out, one-in offense which helped her players get open better and that resulted in a 9-point swing in the third quarter where the Tigers went from being down by five to up by four heading into the final period. The third quarter also saw senior Liz Ording and junior Caitlin McEldowney finding their scoring grooves. 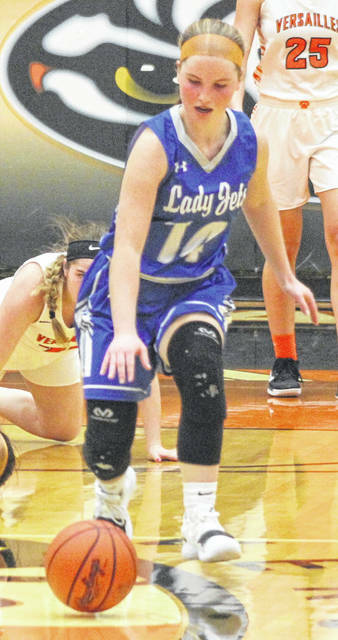 Ording scored 15 of her game-high 19 points in the second half with 6 of those coming in the third quarter, while McEldowney had 17 total points in the game with 9 of those in the third quarter – all on three’s – and 3 more in the final frame. “Liz Ording played a strong, strong game especially in the second half,” Stonebraker said. “She just took it at them. (FM junior Corina) Conley got in foul trouble so we knew we could go at them inside a little bit more and Liz did a nice job finishing around the rim. FM opened the second half scoring with a deuce by Chloe Peters to go up by seven (28-21), but over the next four minutes Versailles went on a 12-3 run to regain the lead at 33-31 with 3:33 left in the period. McEldowney and Ording each accounted for 6 points during that run – Ording on three deuces and McEldowney on a pair of triples. Kennedy Morris hit a pair of free throws at the 3:12 mark to tie it at 33-33, but McEldowney responded with her third triple of the quarter at the 2:58 mark and Brooke Stonebraker got a putback bucket with 1:42 left to push the Tigers out to a 38-33 lead. FM junior Corina Conley then connected on a three of her down to get the Jets to within two at 38-36, but Brooke Stonebraker put in another 2-pointer to end the quarter with her team ahead 40-36. 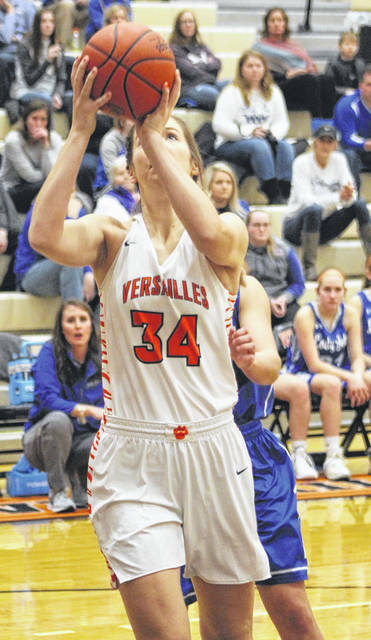 The start of the fourth quarter saw a quick surge to an 8-point lead for Versailles with Ording scoring four points right off the bat, but FM again withstood the Tigers push and got back to within one at 44-43 behind a triple from Conley and a pair of 2-pointers from Stella Shellabarger and Morris. 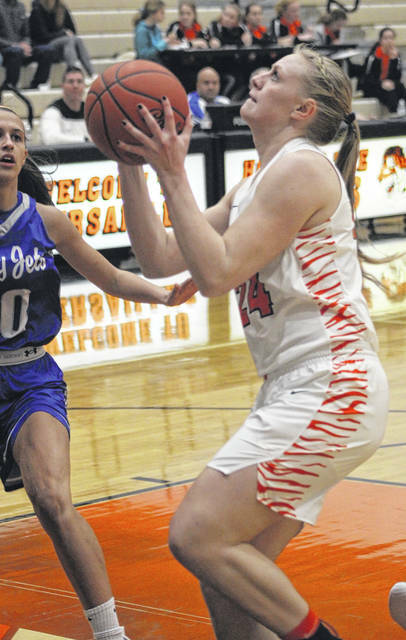 However, with 3:12 remaining, Versailles made one more offensive run and the Lady Jets could not withstand it a third time, according to FM coach Abbey Moore. “The last three minutes we were shot,” Moore said. 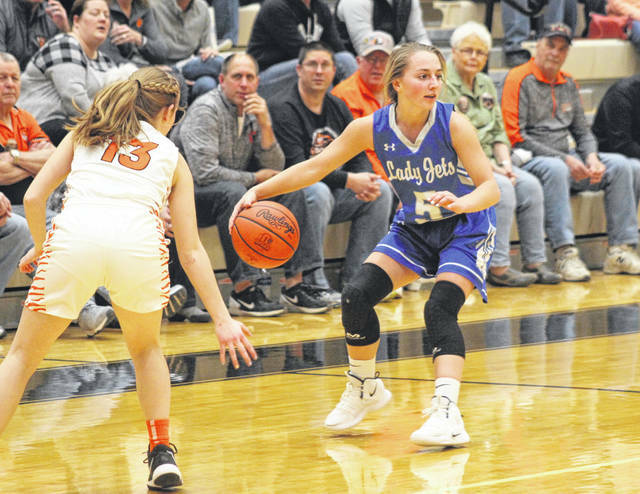 “They were subbing girls in and out the whole game, and unfortunately with limited numbers we can’t do that quite as much and that showed at the end of the game. They had their legs and we didn’t. That last offensive burst for Versailles was a 12-0 run from 3:12 on the clock to 1:56 left with a 56-43 lead. 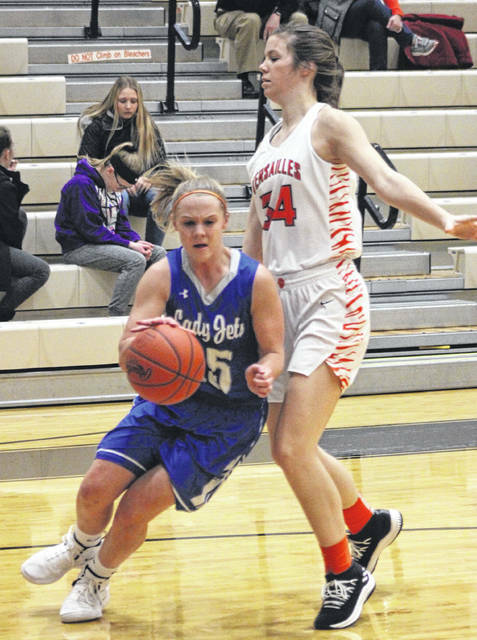 Peters scored one more time for the Lady Jets to get it to 56-45, but Lindsey Winner had one final basket for the Lady Tigers with 1:12 left for the final margin. “I really think the difference in the game was when we went to our four-out and one-in offense,” Coach Stonebraker said. “We didn’t set a lot of screens, we were just cutting and they couldn’t switch and help as much. In the first half, they were denying our wings so we couldn’t get into our offense. We were getting into our offense really high by the half-court line which is not where we want to get into our offense. We couldn’t see our posts from out there. Conley led Franklin-Monroe with 13 points followed by Morris with 12 and Belle Cable and Peters with 8 each. “They did make a run in the third quarter, but I felt like we combated that,” Moore said. “We were able to come back and hit some big shots and got some open looks and that came from our aggressive defense late in that third quarter. We were able to get on a roll, but having to do that twice in a game against an excellent team like Versailles your legs are going to ware on you and I think that second run we made was the last one we were going to make and unfortunately, we didn’t have another one in us. 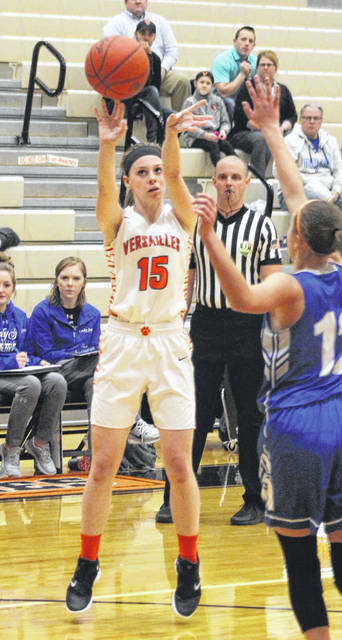 After Ording’s 19 points and McEldowney’s 17, Versailles had Brooke Stonebraker with 9 points and Liz Watren and Winner with 6 points apiece. 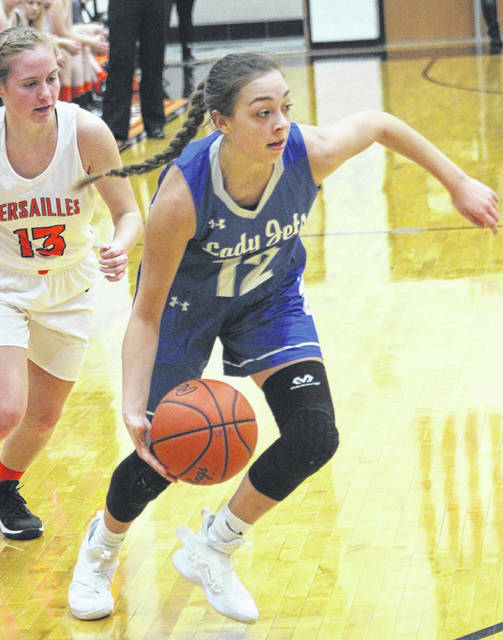 Franklin-Monroe will be back in action with a 6 p.m. start at Bradford on Thursday, while Versailles will host Parkway the same day beginning at 7:30 p.m.
Franklin-Monroe – Belle Cable 2 4 8, Corina Conley 4 2 13, Kennedy Morris 3 5 12, Stella Shellabarger 2 0 4, Chloe Peters 4 0 8. Totals: 15 11 45. Versailles – Liz Watren 3 0 6, Caitlin McEldowney 6 0 17, Hannah Barga 0 1 1, Elizabeth Ording 9 1 19, Lindsey Winner 3 0 6, Brooke Stonebraker 4 1 9. Totals: 25 3 58. 3-pointers – Franklin-Monroe 4 (Conley 3, Morris 1), Versailles 5 (McEldowney 5). 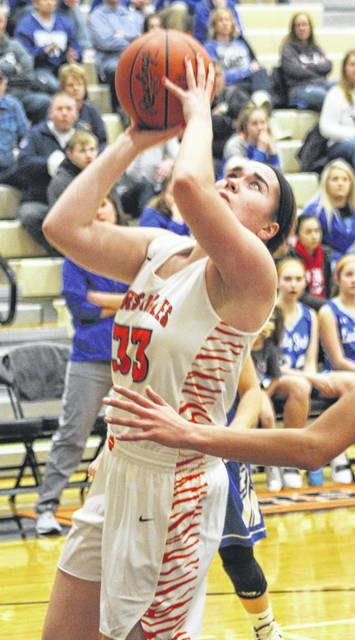 Records: Franklin-Monroe (12-4), Versailles (12-3).